My grandparents are both diabetic. As they are getting older, they tend to eat out for every meal they actually eat. That means less paying attention to ingredients and skipping meals. While home for the holidays, I decided to do a little baking for them. To be quite honest, I bit off more than I could chew. I had dozens of recipes I thought I could make in a day – soups, casseroles, entrees, and desserts using veggies. In about 10 hours time, I made 13 entrees, 4 side dishes, and 3 snacks. 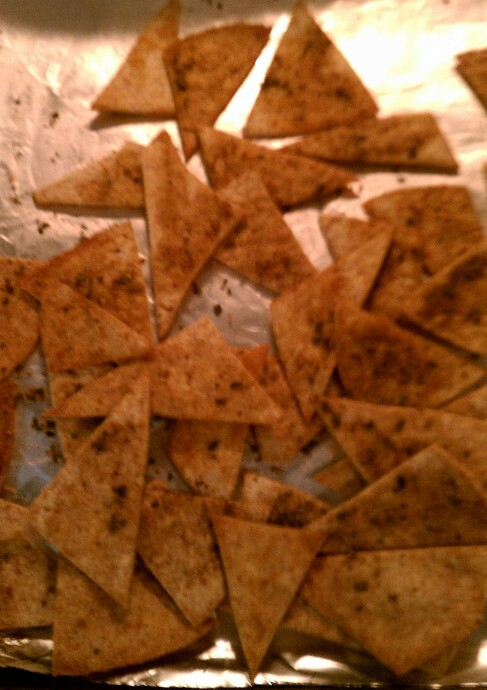 My Grandpa loves salsa so I decided to make him fresh salsa with some homemade tortilla chips. My thought process was to pick a low-fat, high fiber, and whole grain tortilla I could bake. I cooked these up and my Grandpa loved them. I hope you like them too. Brush mixture on both sides of tortillas. Use cookie cutter to cut into shapes. Bake at 400 degrees for 7-9 minutes. Chips will crisp a little bit when they cool. I used scissors to cut into triangle shapes (a pizza cutter would also work). I only coated one side and I thought it was still good. I used Wildtree Fiesta Salsa Mix for the salsa. Wildtree is certified organic – meaning you can read all the names of the ingredients on the side of the bottle and know what they are. 1/4 c. of the mix combined with a can of low sodium diced tomatoes in a food processor makes a great salsa. Just refrigerate for two hours before serving. One of the dried ingredients though is peppers so if you want a milder salsa don’t use as much mix.